How can I do so, without reading each hotel's website or contacting their staff? I prefer hotels belonging to big hotel chains, but not only extended-stay hotels. Same as when looking for a pet-friendly or breakfast-included hotel. 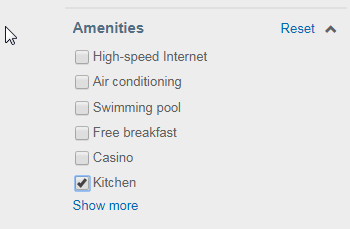 Use a search engine that offers that as a selection under amenities. You may have to click to an advanced page or something like that. Can you book hotels on a prepaid credit card worldwide? Should I book hotels once or multiple times for weeks of staying? Hotel search engine that allows to search for rooms with a desk?